Boxer's Auto-Complete feature will display a popup list of matching words that can be used to complete a partially typed word at the text cursor. The popup list will appear after a (user-configurable) number of characters have been entered, and contains only those words that match the characters just typed. There is no need to interact with the list: if you prefer to keep typing, the list will simply disappear when it becomes irrelevant. Much of the utility of the Auto-Complete feature derives from the relevance of the words that are presented in the popup list. User-defined phrases are those words and phrases that have been pre-defined on the Configure Auto-Complete - User-Defined dialog page. These might include common text strings that you use in your work, your mailing address, email address, etc. These phrases are given highest priority and will appear first in the completion list. User-defined phrases can also be set to expand 1) as soon as they're typed (bte could auto-expand to 'Boxer Text Editor'), 2) only when a delimiter is typed, or 3) only when the Trigger Key is pressed. See Configure Auto-Complete - User-Defined for full details. Auto-Complete also analyzes the existing text of the current file to find potential matches for the completion list. This means that words and phrases that are particular to your document are automatically suggested as matching words. If you're editing a document that contains the term 'diethylthiocarbamate', that word will appear in the completion list, even though it doesn't appear in the dictionary proper. Auto-Complete also intelligently harvests phrases from program source code, making the feature useful for programmers as well. When editing a file for which Syntax Highlighting has been defined, the reserved words for that language will be used as completion words. Finally, Auto-Complete uses a large dictionary of English* words from which all shorter words have been removed. This dictionary is maintained in simple, uncompressed ASCII text format, and is therefore user-editable. 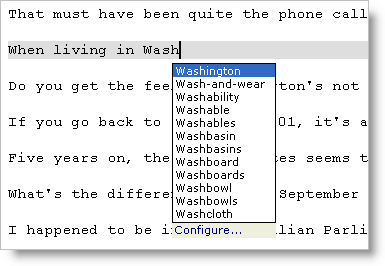 The dictionary can be viewed and/or edited from the Configure Auto-Complete - Dictionary dialog page. * Dictionaries for other languages are not available at this time, but if you can locate a large word list for the language of interest, you can use that list to replace the AC_Words.txt file provided with Boxer. The Sort Lines command has an option to sort lines by line length, making it easy to locate and remove smaller words from the list. If you assemble your list from multiple sources, use the Delete Duplicate Lines to remove duplicates. The final word list should contain one word/phrase per line, and be ASCII-sorted, case insensitive. If the default Auto-Complete settings don't feel perfect to you, you are encouraged to spend a few minutes experimenting with the various options to make sure it feels just right. Some users may find the popup list distracting, and opt to disable it. When Auto-Complete is configured not to display a popup list, the Trigger Key can be used to complete the partially typed word at the text cursor. Pressing the Trigger Key repeatedly cycles through the available matches. By default, the Trigger Key for Auto-Compete is Ctrl+Space. The popup list can be displayed at any time by using the Auto-Complete List command. This command is useful when the popup list has been disabled, or when you want to force the list to appear in a situation where it would not naturally appear (for example, when you haven't typed enough characters for it to appear).